I ate burritos—bean & cheese. God, I don’t want to go into the dark. mind. you have no right to say what you have. loose: you won’t relent and I can’t take this anymore. slip time from my hands? fmf: joy. i don’t understand this poem. but i do understand writing or listening to this song is my heart cry to Jesus. every time I hear. “I don’t want you to see this” and then again, I get teary and shaky. 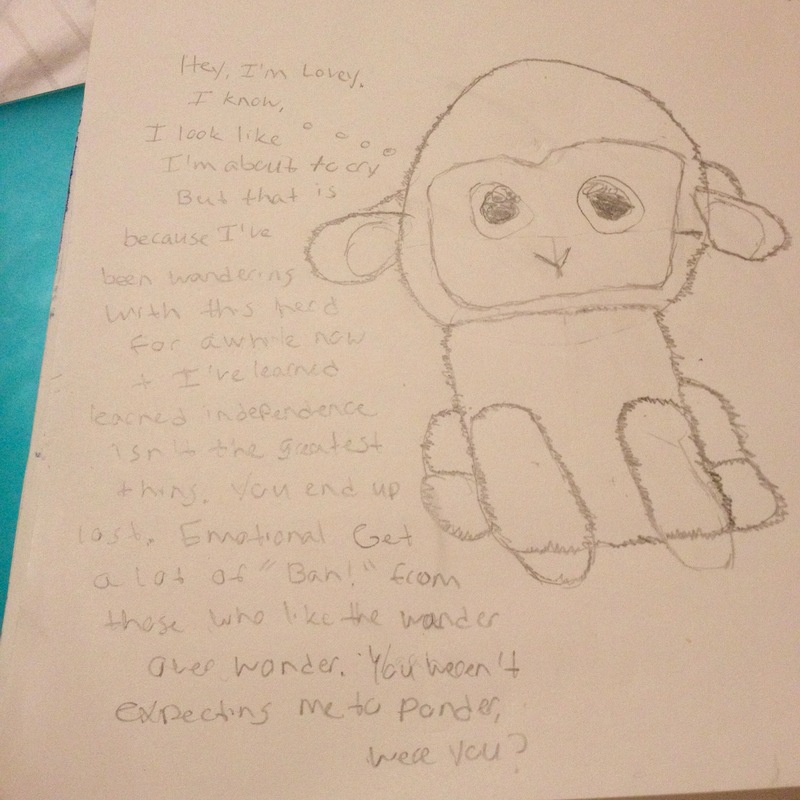 Today I had this idea to write a children’s book about a lamb who is left by her herd due to her feeling too much. Sadness. Over not wanting to wander anymore. Because her herd can’t lead themselves. And Lovey is tired of feeling lost, unloved. She wants to wonder. It needs work, but now it will not leave me alone. Let me not forget to mention that I haven’t written a story in 2 years and that was a complete mess. On the plus side, maybe she can be the lamb, who leads the wanderers? And repeats her words. This will be interesting because it may break my draw one thing and done. Lovey will definitely look different every time. my thought prayers go everywhere; He rejoices. it actually feels like he’s dancing & laughing without a sound. it’s interesting how i feel like he’s giving me a hug. it’s a warmth I’ve never felt, steady. heart to be found by you. helpless cries: be my only. another poem from song titles, this time while a playlist was on shuffle. some of these were seriously difficult to use, but I love how God pulls it all together. jacket I can’t seem shed. get me seen, never left. one beat from a heartbreak. 8th wonder I haven’t seen. Love never fails welcome anyway.